Solved: The Minds Behind The 'NSA' Billboard Reveal Themselves : All Tech Considered Last week, we joined the speculation on who was behind the shadowy billboard on the 101 Freeway near San Francisco — a plain white sign with black text reading, "Your Data Should Belong To The NSA." Now the makers behind the signs are coming clean, and we're not too surprised by who they are. Someone's taken credit for the shadowy billboard on the 101 Freeway near San Francisco — a plain white sign with black text reading, "Your Data Should Belong To The NSA." We wondered about it last week and got some interesting theories in the comments. Another statement adorned a building in New York's Midtown. On Tuesday it was revealed that the mysterious messenger is BitTorrent, a technology company that created a peer-to-peer file-sharing protocol and is founded on the idea of an open Internet. You might know it as that service people use to download copyrighted episodes of Breaking Bad, or the latest screeners of Oscar-contending flicks. But the protocol has legitimate uses, including the release of music by "both signed and unsigned artists," and BitTorrent the company says it's also (legally) entering the TV program distribution business. BitTorrent released a new billboard Tuesday that crosses out "The NSA" and reads instead: "Your Data Should Belong To You." 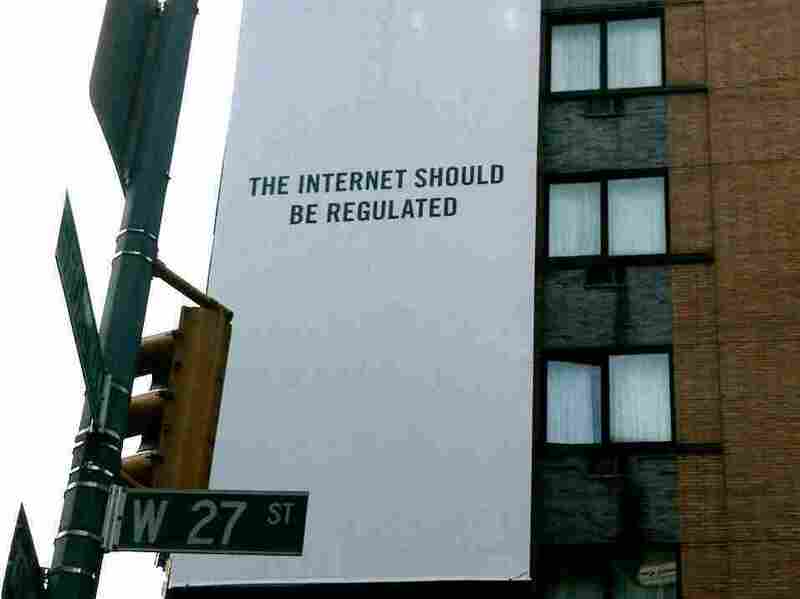 Instead of "The Internet Should Be Regulated," the new version: "The Internet Should Be Regulated People-Powered." 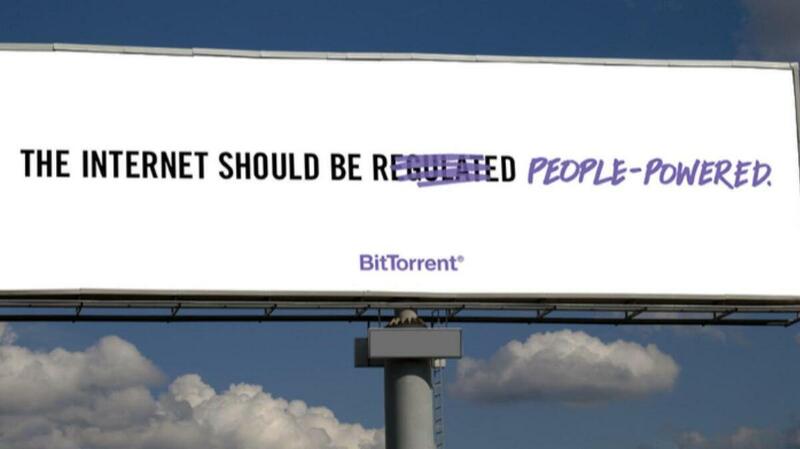 BitTorrent says its core values are user privacy and control and a decentralized, accessible Web. The messages were meant to be a commentary on the current state of the Internet, says Christian Averill, BitTorrent's director of communications. "These statements represent an assault on freedom," he says. "They also, for the most part, represent attitudes Internet culture has accepted. Chips we've traded for convenience." And they're also a clear advertising campaign: Unlike the old versions, these messages are prominently signed with the company's logo.